There's everywhere else, and then there's Banff. With three world-class ski hills – Mt. Norquay, Sunshine Village and the Lake Louise Ski Area – 8,000 acres of skiable terrain, deep powder and one of the longest ski seasons in North America, Banff is the place to be if you're looking for a memorable ski and snowboard experience. 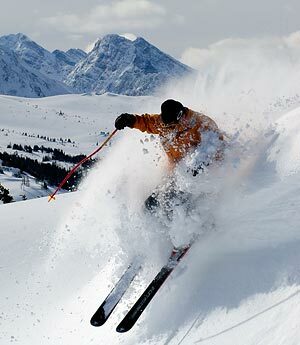 Ski shuttles run from major Banff hotels to all three ski areas and is included in the cost of tri-area lift tickets. Separate ticket holders can reserve seats too. Check current snow conditions or book your ski trip with Ski Big 3. Experienced skiers flock to Banff National Park’s backcountry to find untouched powder. Backcountry skiers should be well versed in avalanche safety. Take a look at Parks Canada’s suggestions for Backcountry Ski Touring & Ski Mountaineering.